FitnessRX for Women > Nutrition > Healthy Eating Tips > Ohh Nuts! Crack Open a Healthy Snack! Have you ever sat around with a group of girlfriends, an equal number of spoons and a jar of peanut butter? If you haven’t, you don’t know what you’re missing. When it comes to comfort food, there aren’t too many foods higher on my list than peanut butter. But in our quest for less fat and lower calories in our diets, peanut butter and nuts in general have exited our spoons and our menu plans. And with them have gone a primary source of health-boosting nutrients, not to mention the wonderful flavors and textures nuts give to foods. 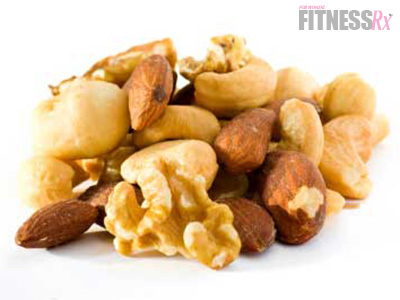 An ounce of nuts has about 165-200 calories and fat accounts for about 80 percent of those calories. Although nuts are technically a high-fat food, researchers are finding that the fats in nuts are extraordinarily important to include our diets. Nuts are low in the unhealthy saturated fats that are known to be the building blocks of blood cholesterol, and they are high in healthy unsaturated fatty acids. Nuts are especially high in monounsaturated fats, contributing, on average, 62 percent of the fat calories. Compared with vegetable oils that are commonly recommended for heart-healthy diets, nuts have less saturated fat than olive oil and only slightly more than canola and safflower oils. Along with the important mono-unsaturated fats in nuts are the famous omega-3 fatty acids EPA and DHA and alpha-linolenic acid (an omega-3 precursor), all polyunsaturated fats important for the prevention of cardiovascular diseases and strokes. More recently, they’ve been in the news for their contribution to mood elevation and weight control. You’d think that the lower the fat in your diet, the better for heart health. But scientists are finding that irrespective of the amounts of fat and nuts in the diet, cholesterol-lowering diets that contain nuts reduce total and LDL-cholesterol (bad cholesterol) concentrations by greater amounts than the American Heart Association’s Step I cholesterol-lowering diet. In a review of nine studies using nuts in the diet, total cholesterol was lowered by four to 16 percent and LDL-cholesterol was lowered by nine to 20 percent. Compare that with the three to 14 percent reduction normally seen with the Step I diet. Just as importantly, the diets containing higher-fat nuts did not reduce HDL cholesterol (good cholesterol) concentrations and increase unhealthy triglyceride levels as did the low-fat, high-carbohydrate Step I diets. The Food and Drug Administration is so impressed with the potential benefits nuts may offer to our health that it has approved the first “qualified” health claim allowed to appear on food packages. A “qualified” health claim has looser restrictions on how much scientific proof is required before statements of possible health benefits can be printed on food packages. The claim is for almonds, hazelnuts, pecans, pistachios, walnuts and peanuts. Manufacturers now may use the following line on FDA-approved packages of nuts: “Scientific evidence suggests, but does not prove, that eating 1.5 ounces per day of most nuts as part of a diet low in saturated fat and cholesterol may reduce the risk of heart disease.” That is equivalent to about one-third of a cup of nuts or two tablespoons of nut butter. But don’t depend solely on that statement for the nutritional content of the food. Make sure to read the back nutrition label for disclosure of the full calorie and fat content of the food. Beyond the healthy fats in nuts is a long list of other nutrients, phytochemicals and bioactive compounds that may extend the health benefits of nuts from cardiovascular protection to body weight control, reduction in insulin resistance and risk of Type II diabetes, mood elevation and slowing of the aging process. Nuts are a major source of fiber in the diet, especially water-soluble fiber. Soluble fibers are important for reducing total and LDL cholesterol concentrations and for helping to control blood sugar levels. Foods high in fiber also have a satiating effect, assisting with calorie-control and weight maintenance. Nuts aren’t thoroughly digested, so some of the calories are never absorbed. Nuts have a strong satiating effect, likely due to their high fiber content. Nuts positively affect energy metabolism, increasing metabolic rate and so compensating for their high-calorie content. The high levels of vitamin E, along with the mono- and poly-unsaturated fats in nuts, play a major role in inhibiting the atherogenic oxidative process that leads to heart disease. High levels of vitamin E, DHA, EPA and alpha-linolenic acid also have critical roles in brain structure and function. Diets high in these nutrients are associated with mood enhancement, improved cognitive function and decreasing rates of depression. Nuts are rich in the B-vitamin folic acid, the amino acid arginine and the mineral magnesium. All three are important for decreasing the risk factors for heart disease. Folic acid is also one of the few nutrients known to help prevent the birth defect spina bifida. Research is only beginning in the area of bioactive compounds in nuts. Nuts contain phytoestrogens similar to those found in soy protein. Nuts also contain plant sterols, which may have multiple health benefits. Give yourself a treat and improve your diet at the same time. Instead of reaching for chips or pretzels, add nuts back into your snack plan. Control the added salt in your diet by choosing unsalted varieties. The next time you’re sitting around with your friends and wondering what to eat, grab a tablespoon of peanut butter and go nuts! Colin A, Reggers J, Castronovo V, Ansseau M. Lipds, depression and suicide. Encephale, 2003;29(1):49-58.